November 14th – December 30th: The Polar Express Train Ride at the Texas State Railroad. Read along with the story as the historic steam train makes its magical journy from the Palestine Depot to the North Pole. Meet Santa and enjoy caroling, hot cocoa, a treat and a special gift for each child. Nov 21st-Jan 21st: Beesley, It Lives! Exhibit—This is a MUST SEE exhibit this winter! Opens in Palestine on Nov. 21 at the Palestine Mall at 2 p.m. Runs Thursday-Sunday through January 21st, 2015. Cost of admission for adults is $5 and children $2. For reservations and questions: beesleyexhibit@gmail.com. November 14th -December 6th:Dickens Village at Lakeview Methodist Conference Center, The Dickens Christmas Village is one that will amaze you! Oooh and ahh over all 3,000 pieces that together depict what life was like at Christmas time during the Victorian era in London. Monday-Friday: Normal business hours; Saturday: 12:30 – 5:30 pm. November 29th-December 21st —Santa’s Workshop : Santa’s Workshop is an indoor Winter Wonderland filled with holiday delights. Take photos with Santa by Lee Loveless Photography. Don’t forget to bring your Christmas wish list for Santa. Saturdays 10am-6pm & Sundays 2pm-5pm;Special hours on December 22 & 23 from 10am-5pm & 24th 10am-3pm. 101 W. Oak Street, Palestine. Beginning November 27th through January 3rd–Christmas Park Land of Lights in Athens. I definitely recommend this one–well worth the drive to see this amazing drive thru display of lights and music! This is one of our yearly traditions. It’s awesome for kids and adults alike!! Open nightly from 6:30-10:30pm. Cost is $25 per car, so bring everyone! More info here. December 5th & 6th –Wyma & Co Holiday Sale. Enjoy this holiday pop-up with antiques, vintage collectibles and much more – 418 Coronaca Street, Palestine. December 6th – Freeze Your Buns 5K Run. Join us for the 3nd Annual “Freeze You Buns Run” 5K! This unique race takes participants through historic Downtown Palestine and one of the historic home districts. Awards will be given to the first and second place runners from each age category. Register by November 25, 2014 to receive the Early Bird Price ($20) and to be guaranteed a shirt. Late registration is $30, shirt cannot guaranteed. Location: 401 W. Main Street, Palestine, Texas. On-site Registration begins at 7:30am. Race begins at 9am. The race is sponsored by the Palestine Regional Medical Center, Palestine YMCA, and Picket Fence Realty, Inc.
December 6th –Breakfast with Santa, 8:30 a.m.You’re invited to Breakfast with Santa and his elves. Enjoy a menu of scrambled eggs, bacon, pancakes and juice/milk (coffee for adults). You’re invited to breakfast with Santa and his elves. Other activities include “Write a Letter to Santa,” “Christmas in Toyland Cupcake Walk,” “Make my own Ornament” and “Christmas Face Painting” and Santa will be on hand to visit with the children. Breakfast will include Tickets are $10 per person and ages 2 and under are free.Palestine Civic Center, 903-723-2026. Limited seating. Advance tickets are $10 for ages 3-12, $12 for Adults, ages 2 and under are free. Tickets at the door are $12 for ages 3-12 and $15 for adults. Buy Tickets at Palestine City Hall, Civic Center, Visitor’s Center. December 6th –Eilenberger’s Christmas, (Gingerbread Village Display on Display Mid November Through December); Photos With Santa (Cookie & Hot Chocolate Provided), 11:30 a.m. – 1:30 p.m., 512 N. John Street, Palestine. December 6th—Children’s Holiday Paint on Canvas– 10:30 a.m. & 2:30 p.m,. (Drops in welcome, but reservations recommended as space is limited – Ages 6-12/Cost $35) O’Sweet Pea – 105 W. Oak Street, 903-723-7321. December 6th—Movies in the Park presents “A Christmas Wish.” Bring your blankets and cider and come watch a movie under the stars at Reagan Park. Movie begins at dusk. December 9th – Christmas Wreath Making Class at O’ Sweet Pea at 7pm. Bring your favorite drink and come make a fun Christmas wreath! Class is $45.00, fee is due by December 6. Reservations required, space is limited. Call 903-723-7321 to reserve. 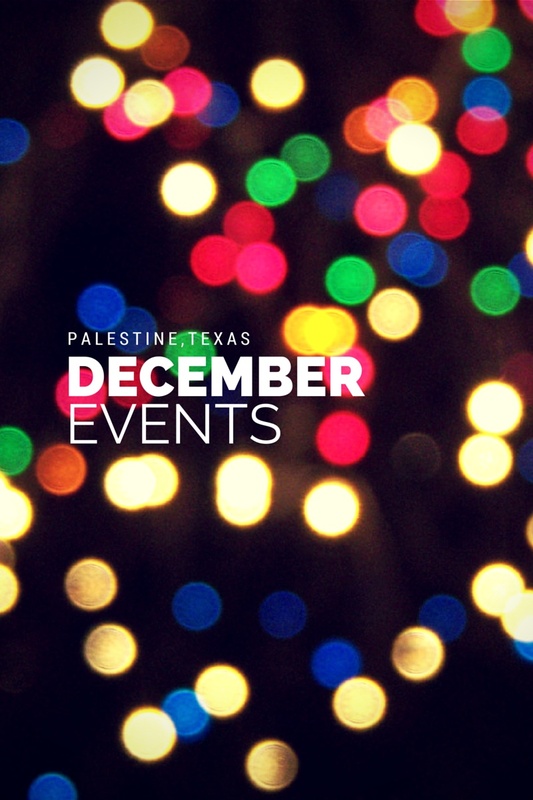 December 12th—Texas Theatre “Ugly Christmas Sweater Party!” Friday, December 12, at 6:30p.m, Palestine Community Theater invites you to eat, drink and be merry before the curtain opens for A Christmas Story. Come dressed in your ugliest sweater and you could win a prize! December 12th–Veteran Angel Tree program: Please sponsor the Angel tree by buying items on the list and returning it to the library unwrapped. New clothing items needed include flannel pajamas size S,M, L, XL; men’s house shoes size S, M, L, XL; sweat pants and sweat shirts sizes S, M, L, XL; blankets, hats, gloves, scarves, socks, gum, and personal care items such as bar soap, toothbrushes, toothpaste, lotion, shampoo, and wash towels. Gift wrap and gift bags are also needed. Bring your gifts to the Palestine library during regular business hours. The last day to collect will be Friday, December 12. Thank you for your generosity this Christmas! December 11-14th — “A Christmas Story” at the Texas Theatre! ONE WEEKEND ONLY! Thursday, Friday & Saturday at 7:30pm and Sunday at 2pm. Buy Tickets Here. December 13th—Palestine Main Street Wine Swirl from 4-7pm. Buy Tickets Here, at the Palestine Chamber or the Palestine Visitor Center. A unique wine & culinary event for wine lovers. Set against the backdrop of our historic downtown, the Wine Swirl brings together a dozen of regional wineries for one evening to offer a taste of their vintages. 903-723-3014. December 13th–Bring in 2 cans of food on December 13th at 9:30 am to receive a free ticket to see The Polar Express Movie at Schulman Dogwood 6 Theatre! Each child will receive a raffle ticket for a chance to win brand new toys! Enjoy an animated Christmas film with the family this holiday season, while giving back to the community! December 13th–Antique Auction at Ye Olde Auction House – Fantastic Furniture, over 75 Stained Glass Windows, StunningHigh End Jewelry, Wonderful Railroad Memorabilia, and Great Smalls! Partial Catalog On-line! – 505 W. Spring, Downtown Palestine. December 20th -Eilenberger’s Christmas, (Gingerbread Village Display on Display Mid November Through December); Photos With Santa (Cookie & Hot Chocolate Provided), 11:30 a.m. – 1:30 p.m., 512 N. John Street, Palestine. Be sure to verify all events before driving out, as hours and dates of operations may change! Enjoy your holidays! Merry Christmas, y’all! –Also, if I missed anything, let me know in the comments and I’ll add it!